As I sit down to write this article, I thought what a shame that I can’t share a fabulous story with everyone on how I had overcome all my weight loss struggles and I was now half the person I used to be. It’s certainly not due to lack of knowledge on how to lose weight. Lord knows I’ve read almost all the books, attended multiple seminars and support groups and tried all the countless miracle pills out there. Yet another year is almost over and another resolution has gone undone. The truth is that I love to eat things that aren’t beneficial to my weight loss, and just because I “know” what I should do doesn’t necessarily mean I’m applying it. Which brings me to the next point. How often do we find ourselves totally immersed in the knowledge of our Savior, yet dropping the ball when it comes to “applying” that knowledge into action? It’s easy to attend church or life groups and represent Jesus well in our actions, but what about when we need to exercise our faith in a more difficult situation? That driver who just cut you off, the co-worker who stabbed you in the back, the neighbor you just don’t like. How do you show the love of Jesus in those situations? Jesus said this because He knew how we would be prone to love those we found easy to love and avoid those we found difficult. No matter how much “knowledge” in the Bible that we possess, if we don’t apply that in our lives, we will never accomplish the goals that God created us to do! We aren’t supposed to pick and choose the parts of scripture that we want and skip the parts we don’t like. When we do, it’s just like my failed diet . 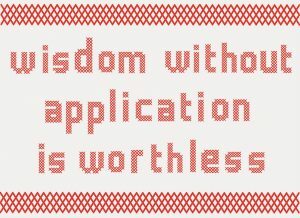 . . not because I lack of knowledge, but because I lack of application. The good news is that God’s mercies are new every day! If you have breath in your lungs then you have the power to accomplish the task God has at hand for you today. Immerse yourself in the wonderful, beautiful knowledge of Jesus and then do the most important next step — apply what it says. Allow yourself to trust Jesus and get through those uncomfortable situations. Sometimes to reach broken people we have to love them in those broken places. The reward for not just “knowing” but “applying” God’s word is eternal and could just very well change someone’s life for the best.